TRUMP’S “BIG AGENDA” (Book Review) « THE BRYCE IS RIGHT! – Trump was vilified like no other presidential candidate in history, yet he still defeated the Democrats. 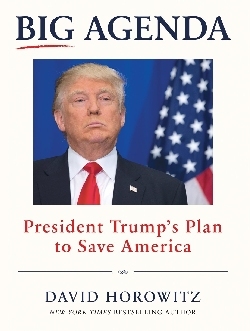 David Horowitz’ new book, “BIG AGENDA – President Trump’s Plan to Save America,” has been receiving good reviews and is a bestseller on the New York Times list. In it, he outlines President Trump’s plans to take back the country and reverse the Progressive agenda as put forth by President Obama, the Clintons, Senator Bernie Sanders, et al. From the outset, Horowitz makes it clear the country is at war with itself, something many of us have long known, but others should study, particularly Republicans. The author begins by discussing the tactics of the Left, which is ultimately based on the work of Saul Alinsky, the famed community organizer and mentor to Obama, Clinton, and many others. Alinsky’s approach is less about frontal warfare and more designed to undermine the status quo by capturing the minds of the masses. The Progressives genuinely believe they are on a noble mission on the same scale as a religious movement, hence their zealous ferver. They believe they know what is best for America and will not be deterred. Consequently, no lie or wrongdoing is too great as long as the end justifies the means. The Left portrays Republicans as unfit to lead the country. This comes from the Alinsky playbook whereby the best way to undermine your opposition is to vilify them. Calling people “racist” or any other deplorable moniker is an an attempt to make them social outcasts and enemies of the state. In reality, Progressives are the real party of hate as they try to prohibit free thinking and free speech using bullying tactics. Democrats do not accept the Constitution as it is viewed as an impediment to their agenda of social change. For example, they do not want a Supreme Court to interpret the Constitution, but implement social justice instead. This was obvious during the presidential debates and recent Judge Gorsuch confirmation hearings. Their Achilles’ heel is their sense of morality; e.g., they do not believe in the rule of law as it pertains to illegal immigrants. The Left is aided by the media and academia which is overwhelmingly Democrat and influencing the masses, particularly our youth. Congressional Democrats have implemented a stalling tactic in hopes the country will elect a new Congress controlled by the Democrats, and anarchists funded by Democratic causes stay in the media’s eye to protest anything violating their agenda. Such chaos could very well backfire on them come time for next year’s mid-term elections as independent voters grow weary of the Left’s whining. With all this in mind, Horowitz makes an important point: Donald Trump was vilified like no other presidential candidate in history, yet he still defeated the Democrats. This shocked the Republicans as much as it did the Democrats. For example, Mr. Trump was the first nominee who had the audacity to stand up to Hillary Clinton, a woman no less, and called her a liar and crook during the debates. Republicans let out a gasp of disbelief, as this had never been done before, even by Mitt Romney who had the chance to call out Barack Obama during the 2012 debates, but failed to do so. Trump’s outspokenness resonated with Americans who were tired of “business as usual” in Washington. It also provided an important lesson; the Democrats must be put on the defensive. The Republicans need to learn how to be tough, a strong lesson Trump gave to a bewildered set of GOP Presidential candidates. He taught us it is time to be strong and fight back. Towards the end of his book, Horowitz finally gets around to describing his vision of Trump’s battle plan, particularly in the first 100 days of his administration. Interestingly, most of the items listed have been addressed by the President. There are some points that were not implemented but will likely be considered shortly, such as relocating America’s Embassy in Israel to Jerusalem, Infrastructure spending, and attacking the past indiscretions of the IRS, but there is still considerable time remaining to do so. Horowitz also stresses the importance of offering a new deal to Black America in the inner cities, who have suffered for decades under the rule of the Democrats. If Trump can improve education, clean up crime, and create jobs for the inner cities, this will be welcomed by Black Americans, an important voting block for the Democrats. This is why the mayors of Democrat-controlled cities are fighting Trump over such things as Sanctuary Cities and school voucher programs. As I said, Horowitz’ book will be an epiphany for those who haven’t been paying attention to the political landscape over the last ten years, but it is common sense for the rest of us. All Republicans should read it for the battle-cry it represents. High school and college students should also study it to understand both sides of the two political ideologues. Yes, this is war, yet some Republicans naively believe it is nothing more than simple politics. As Horowitz points out, we have gone well beyond simple politics, this is a fight for the fundamental character of America, our morality, our sense of right and wrong. A war where one side embraces the morality and governing principles of our founding fathers, and another determined to set us on a different path. One side believing in capitalism, another in the redistribution of wealth a la socialism. One aimed at improving the gross domestic product, and the other nothing more than a rearrangement of the deck chairs on the Titanic. The book spells out a “take no prisoner” approach to fighting the Left and saving the country. Basically, Horowitz is admonishing Republicans to reverse the tables and do unto Democrats what they have been doing all along to the GOP. NEXT UP: GETTING FIRED – What to learn from the experience. LAST TIME: THE 99% COMPLETE SYNDROME – You’re probably measuring the wrong thing if you keep asking for this figure. This entry was posted on May 22, 2017 at 8:00 am	and is filed under Politics. Tagged: Florida, palm harbor, The Bryce is Right, tim bryce, TRUMP'S BIG AGENDA. You can follow any responses to this entry through the RSS 2.0 feed. You can leave a response, or trackback from your own site.